What weight will my mobility scooter carry? The weight that your mobility scooter will carry is actually part of the specification of your scooter. However, please bear in mind that the closer that you are to the maximum rider weight, the harder your scooter has to work to propel you along, especially when going uphill. This may have a detrimental impact on the life of your mobility scooter. The scooters we supply here at Mobility Nation include, car transportable mobility scooters, lightweight mobility scooters and more. Visit us online for further information. Introduction: There are many different types and designs of mobility scooter available on the market today & for the uninitiated it can be a minefield to navigate or even to know where to start. So exactly how does one go about picking the perfect mobility scooter for their needs? The first thing to be aware of is that there is no such thing as the perfect mobility scooter. Any purchase will always be a compromise - want a lightweight scooter but need massive range? Batteries are heavy. Need a captain’s chair but must fit in a small car boot? Captain’s chairs take up a lot of space leaving little left for the body of the scooter. Some customers may have been disqualified from driving due to deteriorating eyesight or poor health so they may need a Road legal mobility scooter (called Class 3). I would like to be able to do my weekly shopping with it. Class 2 mobility scooters are can weigh no more than 113Kgs and travel up to 4MPH. They are to be used on footpaths and pavements only. Class 3 mobility scooters can weigh up to 150Kgs and can travel up to 8MPH. When being ridden on pavements they must be restricted to 4MPH maximum for safety reasons. They are road legal also which means that they come with a lights front & back, indicators and a small horn / buzzer. Whilst they are legal to ride on the road, caution should be exercised as cars and lorries whizzing past at 50MPH can be very unnerving! 3 wheel versus 4 wheel: The most popular scooters come with 4 wheels, but 3 wheel versions are available. The advantage of the 3 wheel scooters are that they are sometimes more manoeuvrable for riding in tight spaces like shopping aisles etc but the downside is that they are more prone to tipping over, especially on adverse cambers. One piece body: The main body of the scooter comes in one piece but the seat and battery are removable. This is simple to assemble but the one piece body can be heavy and cumbersome to load into the car. If you have two people to help when loading then this can be a way to manage it. These split into 3 pieces. Two piece body: The main body of the scooter can be split apart into the front half and the back half. These are easy to manage and lift, but can be fiddly to assemble depending on the mechanism design. The seat and batteries are removable so these split into 4 pieces. Ultralight: This type of boot scooter folds up like a child’s push buggy. Some designs are quite ingenious with folded dimensions that fit inside a small suitcase. The main disadvantage is that when folded they can still be quite heavy as they still remain in one piece including the seat and battery. Also, the batteries tend to be quite small so will yield minimal range. They can be quite expensive also. Scooter storage: Where will you be storing your scooter? A basic option is to buy a standard PVC cover. There are some clever options for scooter storage that have recently come on the market. One of them is a scooter shelter that the rider can ride into & pull over the top of the scooter locking it securely afterwards. There is no substitute though for keeping your scooter in a secure warm environment. Remember though, at the end of the day, they are electronic devices - would you store your TV there? Charging: Don’t forget that your scooter will need to be charged regularly. This isn’t really a problem with boot scooters because the batteries can be removed for charging in a convenient location. However, if you opt for a larger scooter, you will need access to a charging point wherever the scooter is stored. Battery capacity versus range: Battery capacity is measured in units called Amp / Hours. Simplistically speaking this means the amount of current (measured in Amps) that the battery can supply continually for one hour. Therefore the more Amp / Hours (AH) the battery has, the further your scooter will be able to travel. The heavier your scooter is, the more current will be needed to propel it on it’s way. As a rule of thumb, if a Mobility Scooter manufacturer quotes a range of for example 20 Miles in ideal conditions, you should assume a realistically usable range of two thirds that. This will take into account variables like terrain, tyre pressures, rider weight etc… The bigger the batteries are, the heavier the scooter will be. Battery rating scam: Scooters typically employ 24 volt systems, which means that they have two 12 volt batteries connected in series to give a 24 volt supply. Two 12AH batteries connected in series is still a 12AH battery capacity (because it provides 12AH at 24 Volts). Be wary of some unscrupulous vendors that describe their scooters as having double the AH rating than they actually have. Ensure you compare like-with-like when looking at specifications. Seating comfort: Most boot scooters come with a fairly basic seat design. This will typically include seat rotation, seat height adjustment and arm-rest adjustment only. Larger scooters such as Class 3 scooters usually come with what is known as “Captain’s Chairs”. These incorporate a wider range of adjustments such as seat slide, seat recline, head rest adjustment etc… Whilst these are great for obtaining the perfect riding position, they can add significant weight to a scooter and the customer would need to be reasonably able bodied to remove it if the scooter had to be transported in a car. Try before you buy! Before parting with your hard earned cash, make sure that you test ride a range of scooters first. Nothing beats actually trying the scooter first, it is the only way to be sure that the seat is going to be comfortable and that you have adequate leg room. Weather protection: One final thing to consider when choosing a scooter is the sort of protection you require from the wind and rain. When riding a boot scooter, your options are fairly limited & most people opt for a raincoat or ride on Zip-Up Cape. These cover both the rider and the scooter in the event of an unexpected shower. The rider can zip themselves up and pull a hood over their head. Not ideal but better than getting soaked! Larger scooters are generally available with the option of a fully fitted canopy that incorporate a sturdy metal frame. Riders can zip up the sides so they will be cocooned away from the worst of the elements. Most designs allow the rider to partially unzip the sides so things like Zebra crossing buttons can be pressed without having to leave the shelter of their canopy. This is by no means an exhaustive list of things to consider when choosing a mobility scooter, but we hope that it has provided some structure and food for thought. Good luck, the benefits of independent living that a scooter can bring are amazing! Mobility Scooters - How far will my scooter travel? Most of the mobility scooters we supply here at Mobility Nation will travel for approximately two thirds of their ideal range (part of the spec unique to each scooter). This is to cater for a number of variances that include, rider weight, type of terrain, tyre pressures and more. So for example, our Explorer 4 mobility scooter is specified at up to 18 miles range but we suggest a realistic range of 12 miles – 6 miles there and 6 miles back. The scooters we supply include car transportable mobility scooters, lightweight mobility scooters and more. Visit us online for further details. One of the most commonly asked questions/statements that we get asked about our mobility scooters is, “It’s good that my scooter comes with pneumatic tyres because it gives me a nice smooth ride, but can anything be done to prevent punctures?”. At Mobility Nation we sell a puncture Prevention System that is a gel and can be put in the tyres either by the customer or pre-installed for you. It protects against punctures in objects up to 6mm in diameter, so for example it will protect against screws, nails, tacks, that sort of thing. What it can’t do is protect against slashes or cuts in the tyre because at the end of the day it is just a self sealing gel. It is highly recommended and our most popular selling accessory. 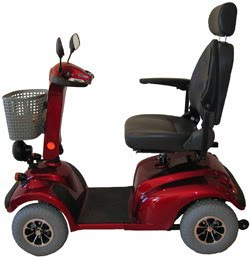 Visit us online for more details on our mobility scooters and other products.